Itch (Latin: pruritus) is an unpleasant sensation that leads to the desire or reflex to scratch. Itch has many similarities to pain and both are unpleasant sensory experiences but their behavioral response patterns are different. Pain creates a reflex withdrawal while itch leads to a scratch reflex. Nerve fibers for itch and pain both are in the skin, but information for them is sent centrally in two distinct systems that both use the same nerve bundle. 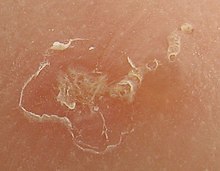 Historically, the sensations of itch and pain have not been considered to be independent of each other until recently where it was found that itch has several features in common with pain but has important differences. The feeling of itchiness can be caused by a movement of hair or the release of a chemical (histamine) from cells under the skin. Itchiness is regarded as protective, as it helps creatures remove parasites that land on their skin. Xerosis. This is the most common cause, frequently seen in winters. Associated with older age, frequent bathing in hot showers or baths, and high temperature and low humidity environments. Allergic reactions to contact with specific chemicals, such as Urushiol from Poison Ivy or Poison Oak. Andrew D, Craig AD (2001). Spinothalamic lamina I neurons selectively sensitive to histamine: a central neural pathway for itch. Nature Neuroscience Jan;4(1):9-10. ↑ Ikoma, A., Steinhoff, M., Stander, S., Yosipovitch, G., Schmelz, M. (2006). The neurobiology of itch. Nature Reviews Neuroscience, 7(7), 535-547. ↑ Greaves, M.W., Khalifa, N. (2004). Itch: More than skin deep. Int Arch Allergy Immunol, 135, 166-172. ↑ Twycross, R., Greaves, M.W., Handwerker, H., Jones, E.A., Libretto, S.E., Szepietowski, J.C., Zylicz, Z. (2003). Itch: scratching more than the surface. Q J Med, 96, 7-26. The Simple English Wiktionary has a definition for: itch. This page was last changed on 2 June 2013, at 02:11.